Thinning or loss of hair loss can be caused by the aging process and the daily stressors of life. While there are many reasons why hair growth slows or hair follicles decrease in length or are retained for shorter periods, few of us are happy with the result. Acne, surface skin wrinkles --any loss of skin health, really, is equally troubling, and weak or yellowed nails can be a symptom of a nutritional deficiency. 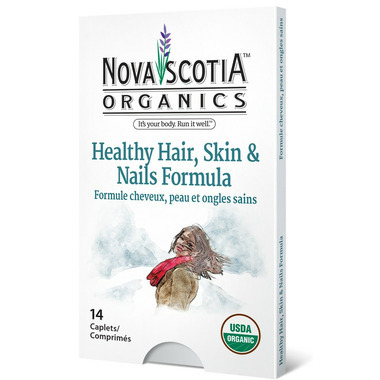 The Nova Scotia Organics Healthy Hair, Skin & Nails Formula adds Vitamin A, Vitamin C, Folic Acid, (or Folate, one of those terrific B Vitamins), Biotin, and Zinc, as well as Bhringaraj Leaf used in Ayruveda to maintain and rejuvenate hair, teeth, and bones. Each of these ingredients has properties related to healthy hair growth, reduced production of skin surface sebum, or contain properties that are constructive in maintaining healthy hair, skin or nails. They've even included Horsetail, a plant based ingredient that may have you tossing your own mane in a whole new way. How to Use (Adults): Take 1 tablet per day with food, and a few hours before or after other medications or natural health products. Cautions and Warnings: If you are pregnant or breastfeeding, consult a health care practitioner prior to use. Keep out of reach of children. Store between 15 and 25 degrees celsius in a dry place. Do not use if packaging is damaged. Carnauba Wax, Lemon peel extract and Maltodextrin. Amazing product! 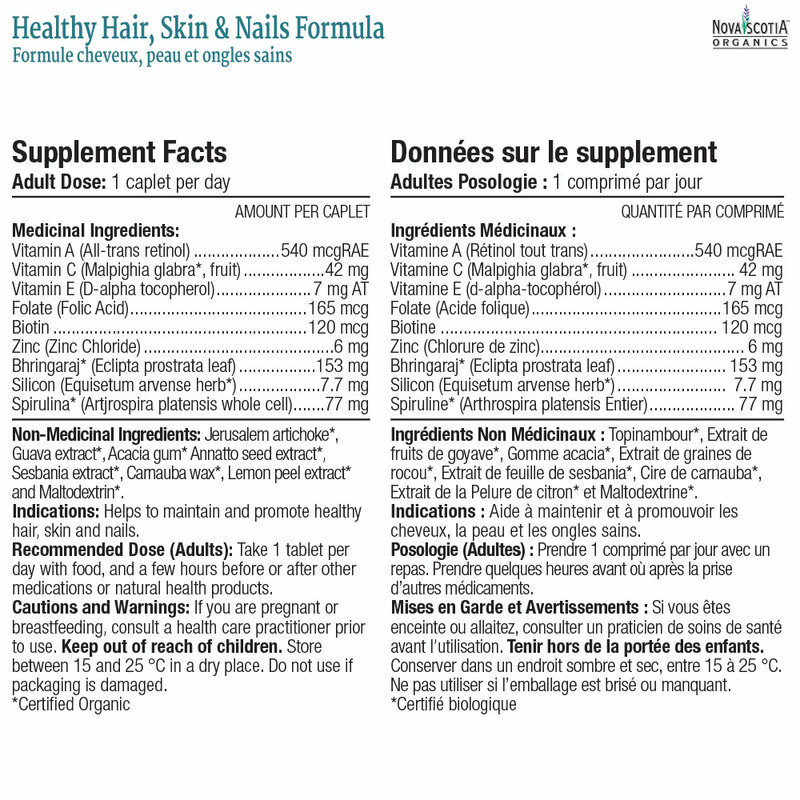 Silky hair that is growing fast, no acne, less rosacea. I will DEFINITELY repurchase this product but next time in the bottle!